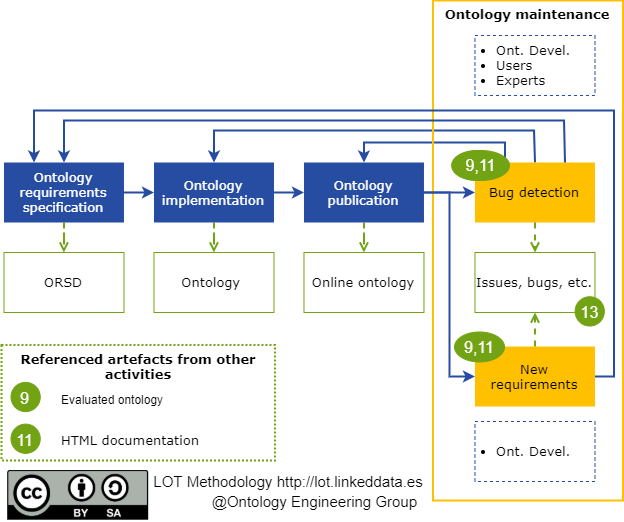 LOT (Linked Open Terms) Methodology is an industrial method for developing ontologies and vocabularies. This website will provide support for following the LOT methodology in your developments. The aim of the requirements specification process is to state why the ontology is being built and to identify and define the requirements the ontology should fulfil. Taking as input the documentation and data provided by domain experts and users, the ontology development team generates a first proposal of ontological requirements written in the form of competency questions or statements. In this step, involvement and commitment by experts in the specific domain at hand is required to generate the appropriate industry perspective and knowledge. Once domain experts and users in collaboration with the ontology development team validate whether the ontology requirements defined in the previous step are correct and complete. Conceptualization: the aim of this activity is to build an ontology model from the ontological requirements identified in the requirements specification process. During the ontology conceptualization, the domain knowledge obtained from the ORSD document is organized and structured into a model by the ontology developers. Ontology reuse: during this activity the term extraction is carried out, by identifying basic concepts and the relationships between those concepts are extracted. These extracted terms should consist of not only the terms from the data source, but also of synonyms of those terms. The terminology might be extracted from the competency questions (Guidelines from NeOn Methodology) or from the data, for what you might have domain expert advice. 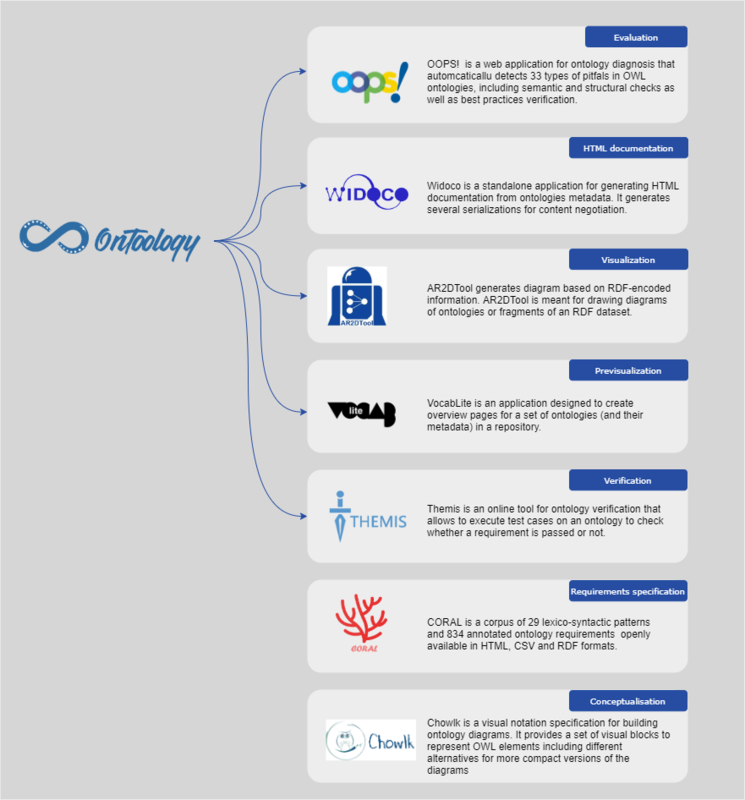 These terms will be used during the ontology search with the aim of looking for existing ontologies that best fit them. Encoding: during this activity, the ontology development team generates computable models in the OWL language from the ontology model. 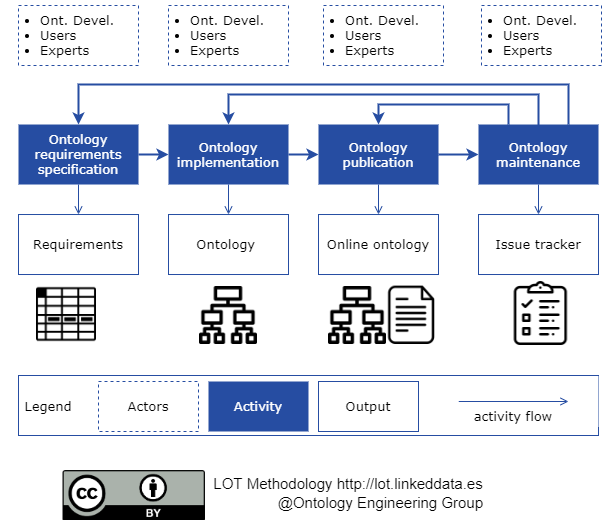 The ontology code resultant from this activity includes metadata, such as creator, title, publisher, license and version of the ontology. Evaluation: during this activity, the ontology developers guarantee that the ontology does not have syntactic, modelling or semantic errors and that the ontology fulfil the requirements scheduled for the ontology using the test cases generated in the requirements specification process. Documentation: the ontology development team in collaboration with the domain experts generates the ontology documentation of the release candidate. This documentation includes an HTML description of the ontology which describes the classes, properties and data properties of the ontology, and the license URI and title being used. The domain experts have to collaborate with the ontology development team to describe the classes and the properties. This description also includes metadata, such as creator, publisher, date of creation, last modification or version number. The documentation also includes diagrams which store the graphical representation of the ontology, including taxonomy and class diagrams. Publication: once the documentation of the ontology has been generated, the ontology is published on the Web. This online ontology is accessible via its namespace URI as a machine-readable file and a human readable documentation using content negotiation. 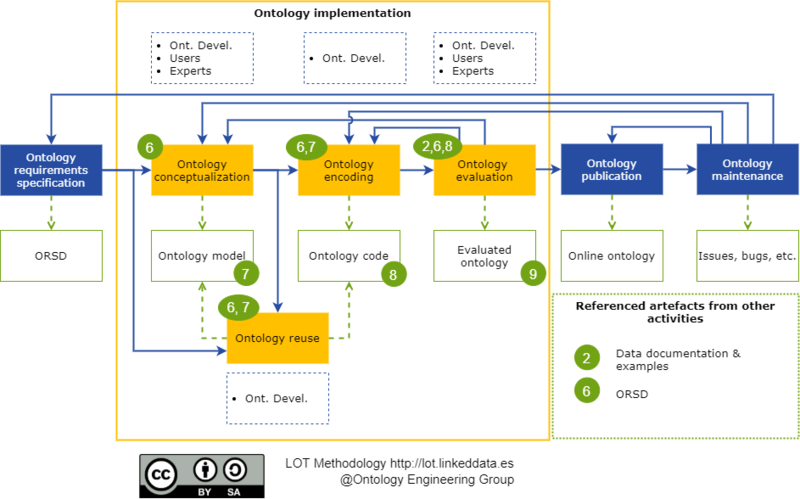 The goal of this activity is to update and add new requirements to the ontology that are not identified in the ORSD, to identify and corrects errors or to schedule a new iteration for ontology development. During the ontology development process, the domain experts can propose new requirements or improvements over the ontology, as well as identify errors both in the requirements and in the implementation. VICINITY is an EU funded project under Horizon 2020. It proposes a platform and ecosystem that provides "interoperability as a service" for infrastructures in the Internet of Things. EasyTV is a H2020 European project which main goal is to provide equal access to television and audio-visual services to that all users, especially persons with disabilities and users with special needs. DELTA is an EU funded project under Horizon 2020. It proposes a demand-response management platform that introduces scalability and adaptiveness into the Aggregator’s DR toolkits. The content on this website is available to share and use under the Creative Commons Attribution Non Commercial Share Alike license .